A major internet outage has hit Somalia with people in the capital Mogadishu not having access for five straight days as at Wednesday June 28, 2017. A Voice of America (VOA) journalist, Harun Maruf, said according to sources the cause of the outage was because undersea cables had been cut by a large ship. Among the worse affected are the media, businesses and government offices. 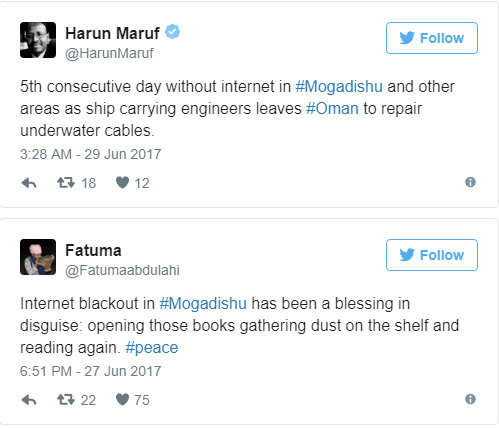 A Somali news portal quoted a senior director of the Ministry of Posts and Telecommunications Ahmed Haji Ali, as confirming the outage which he said started shortly on Monday after suspected commercial ship hit the fibre optic internet cable in the Indian Ocean. Reports indicate that many Internet Service Providers (ISPs) in the country rely on the affected cable line resulting in internet and fixed voice service providers to go down. The journalist reported that engineers had been dispatched from Oman to repair the cables but did not state when connection will be restored. It is also said to have affected money transfer transactions especially coming during the end of Ramadan period. The most recent African country to suffer a similar challenge was Congo-Brazzaville, who hade their internet disrupted for over two weeks owing to a fibre optic cable cut. Connection was restored on Saturday (June 24) after 15 days of nationwide disruptions and slowdowns that started since June 9, 2017, after a damage to the country’s main submarine cables. The restoration was ahead of the five-week projected period given by the technical team working on the cut cable. Network providers confirmed days after the outage that the problem was caused by a submarine cable cut off in the Atlantic Ocean near the economic capital Pointe-Noire.